Women of TV have united against lupus! Presenting “Empower: Fight Like A Girl”, a special collection of short stories by top women writers from some of your favorite shows, including: Marvel’s Agents of S.H.I.E.L.D., Family Guy, Person of Interest, Grimm, Battlestar Galactica, Buffy the Vampire Slayer, Law & Order: SVU, Star Trek: Voyager, Eureka, Twisted, The 100, Malcolm in the Middle, Millennium, Being Human, The Shield, Castle, Chuck, Gilmore Girls, and Game of Thrones. In this anthology, you’ll discover supernatural thrillers, crime mysteries, horror, comedies, and more. – Lee Goldberg, New York Times bestselling author of The Chase and King City, whose mother lost her hearing to lupus. Women of TV have united against lupus! 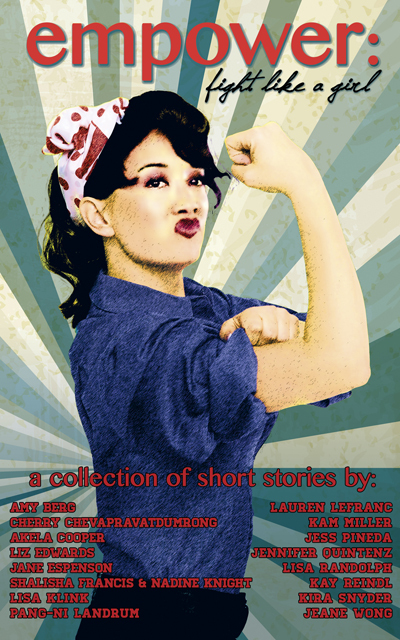 Presenting Empower: Fight Like A Girl, a special collection of short stories by top women writers from some of your favorite shows, including: Marvel’s Agents of S.H.I.E.L.D., Family Guy, Person of Interest, Grimm, Battlestar Galactica, Buffy the Vampire Slayer, Law & Order: SVU, Star Trek: Voyager, Eureka, Twisted, The 100, Malcolm in the Middle, Millennium, Being Human, The Shield, Castle, Chuck, Gilmore Girls, and Game of Thrones. In this anthology, you’ll discover supernatural thrillers, crime mysteries, horror, comedies, and more.